box and the reciprocating or rotating member, effecting a seal. and many other types of mechanical equipment. Compression packings are relatively easy to install and maintain. With proper attention, a high degree of successful operation can be anticipated. Careful selection of packing materials to meet the specific application requirements. Proper attention to good installation and break-in procedures. High standards of equipment maintenance. function of blocking the passage of fluids being pumped, thus preventing excessive leakage. Compression packings used in valves where there is slow or infrequent motion, and those used in static operations, are required to seal without leakage. Various impregnants may be used to assist in this function. Some packings are designed with non-migrating stable lubricants for operation under extreme pressure and temperature. 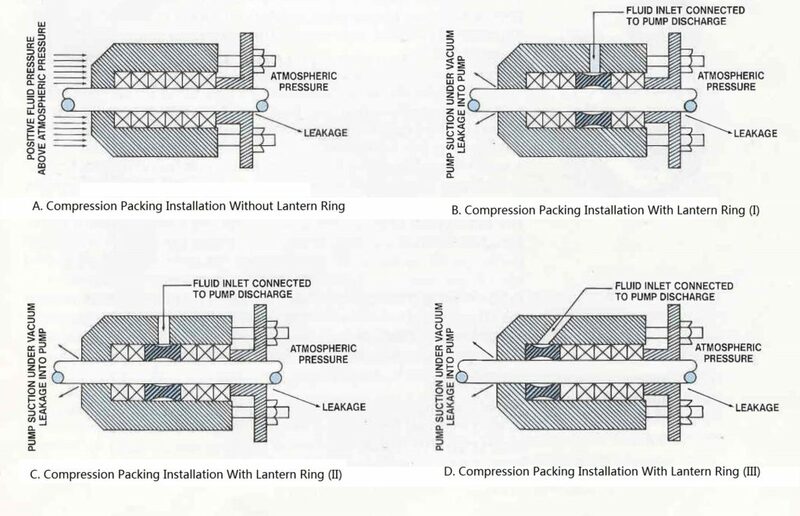 Depicted below are typical methods of the use of compression packings in pumps. 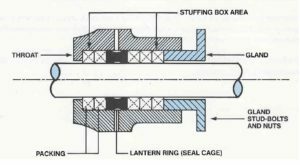 Note the use of lantern rings (seal cages) where external means of lubrication are required.